I didn’t know it existed until my kindly husband pointed out that my family has issues with ‘food rage’. Food rage stems from a greedy sense of entitlement one feels towards a certain dish that one must, unfortunately, share with others. The discussion was launched as we counted out our prawns for our cold prawn, bread and avocado picnic. I was blessed with a gift to shell and eat prawns at light speed. It’s all about the technique (and gluttony). Due to a prior incident, we have since decided that counting them out before I get the chance to eat them all is good practice. AT pointed out examples of how my family members suffer from a kind of food rage, a dinner table anxiety. It will only occur in groups, usually family dinners, usually involving a dish that is highly prized. By at least one person at the table. I’ll start with salad. Mum makes the best salads. It sits there patiently at the table while we eat our main meals, the bits at the bottom getting all soggy and delicious in the dressing. And then we’ll notice half way through the meal that salad has been decimated. And then we’ll look at the usual suspect sitting there crunching on a cucumber. Dad. He eats faster than me and consequently he is always finished first and gets stuck into the salad before anyone else. He seems to forget there’s six other people sitting at the table that wouldn’t mind eating their share of salad too. We have to be tactful, watchful and respectful to the head of the family, the provider of the lovely meal. It’s a tricky situation. We usually manage to reign in the ‘rage’ during these moments. Mum has learnt from this and makes a salad large enough to feed fifteen people. And then there’s crackling. Crispy, crunchy pig skin that usually accompanies the occasional pork roast. Usually Christmas dinner. It’s even worse these days since we have noticed yet another contender, my eldest KT. He loves it as much as we do. Some clever soul usually offers to ‘help’ mum dish up. This usually involves pinching more than a few choice pieces of crackling. 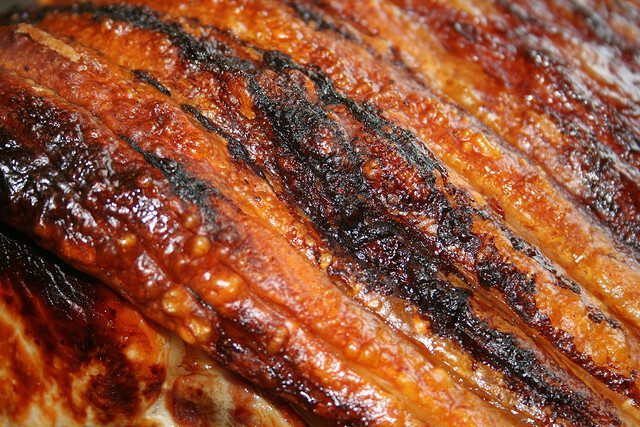 The crackling is placed on the table. Mum takes her pick. Fair enough, she cooked it all. Then it’s passed around and we all try and grab one of those extra crisp, bubbly bits. Some of us aren’t fussed. But at least four of us – I won’t mention any names – are watching the plate closely. The table is monitored carefully and when it seems as if enough time has passed, we go in for seconds. Usually innocently, asking if everyone has had enough, and sometimes debating as to who has had what. It is not usual for this crackling anxiety to break out in a fight, but it has happened in the past. And again, we have learned from this. These days mum buys an additional slab of pig skin. Keeps the peace. And now for the cauliflower cheese. This is a sensitive issue in our house. My sister has a reputation, a bad reputation in our family for her love of cauliflower cheese. But love is such a mild word. Perhaps aggressive, irrational obsession is closer to the truth of it. 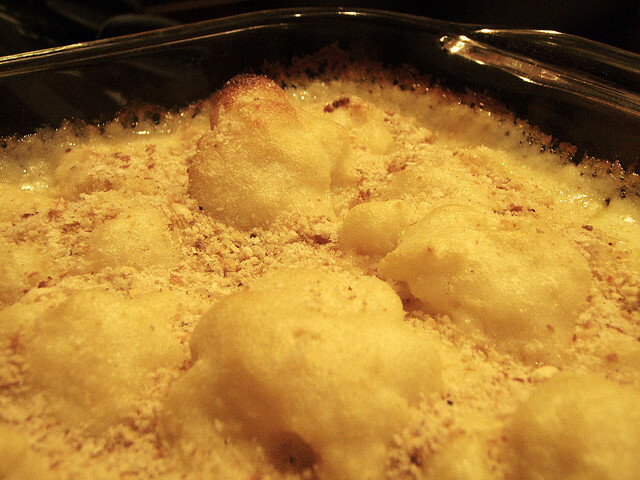 Cauliflower cheese (which is steamed cauli smothered in cheese sauce and baked) is whipped out occasionally throughout the year and always on VC’s birthday. During these occasions, VC is on full alert; her seating strategy is her key to her success. If she sits as close as possible to the dish, she has the best chance of ensuring a second helping before anyone else has a chance. The best opportunity guaranteeing maximum exposure. After years of cauliflower-rage-related behaviour, we all know to stand well back. Mum knows it’s for the good of the family to make double quantities. We all understand that VC gets to take the left overs home for lunch the day. Some of life’s lessons are learnt the hard way. Oh I laughed out loud, is it because i see the tableau before me and know all these little idiosyncrasies so well. Actually dad thought I got food rage cos I grew up in a poor family with more kids than food. Thats not the excuse offered here. You just nailed it Lara, make sure JC reads it. Haha, I absolutely LOVED this post! It’s funny because as passionate as you guys always claim to be about food I’ve never actually noticed it when I eat with you all. Then reading the subtelties involved with your “food rage”, I could actually picture it all happening!